Preheat oven to 400°. Place potatoes in a greased 15x10x1-in. baking pan; drizzle with olive oil. Sprinkle with 1/4 teaspoon sea salt; stir to combine. Bake 30 minutes. Meanwhile, squeeze 1/3 cup juice from limes, reserving fruit. Combine lime juice, melted butter, chipotle and remaining sea salt. Remove sheet pan from oven; stir potatoes. 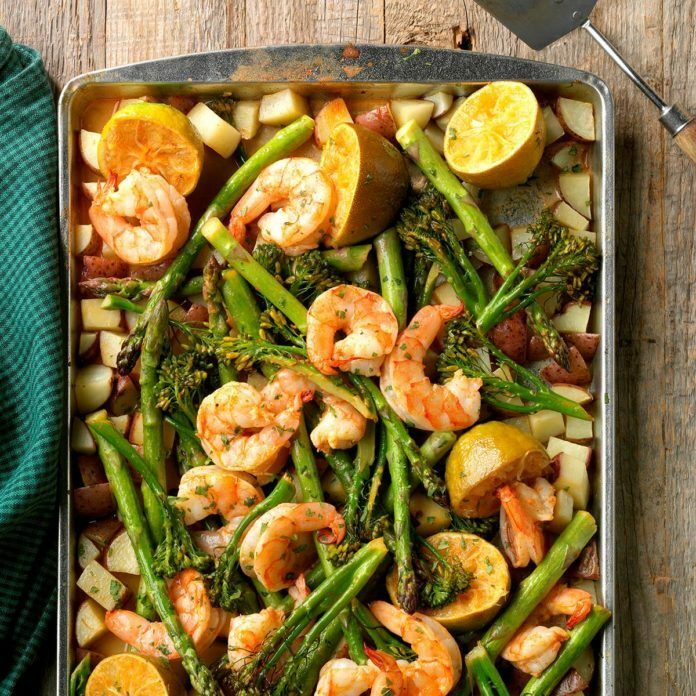 Arrange asparagus, Broccolini, shrimp and reserved limes on top of potatoes. Pour lime juice mixture over vegetables and shrimp. Bake until shrimp turn pink and vegetables are tender, about 10 minutes. Sprinkle with cilantro. Don’t throw out the squeezed limes. You’ll be surprised by how much juice comes out of them after they’re roasted. Can’t find baby red potatoes? Try baby Yukon Gold potatoes. 1 serving: 394 calories, 17g fat (8g saturated fat), 168mg cholesterol, 535mg sodium, 41g carbohydrate (4g sugars, 6g fiber), 25g protein.